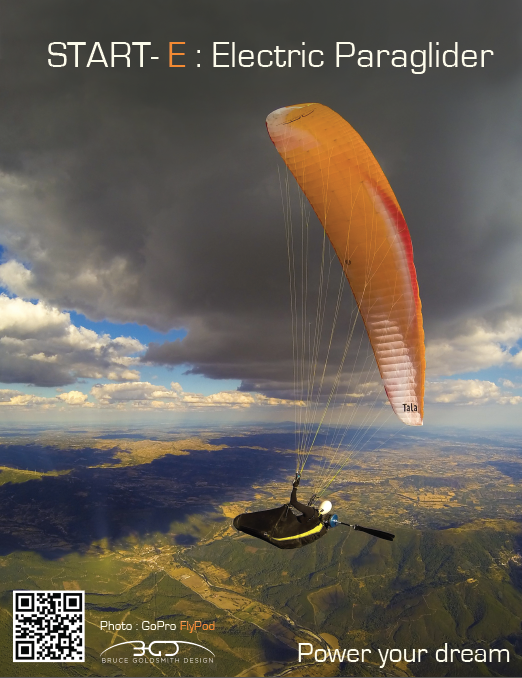 Start-E:The concept "Plug and Fly" applied to paragliding! With the Start-E you will no longer lose an opportunity to fly, you'll always be ready to fly where it's good! and when it's good! Several years of dreams, development, and the achievement of various prototypes, were used to get a lightweight electric motor kit adjustable for free flight harness. The start-E will allow you to take off in flatlands and take several hundred meters height with a rate of climb of about 2m/s, so you can pick up a dynamic lift or explore a wide area to find your first thermal. You can also leave from your normal takeoff, and use the Start-E to pick up a usually inaccessible confluence, and if you miss a thermal to complete your circuit, the Start-E will give you the boost to finish without having to seek a recovery. Start-E will open the doors of flights you thought until now impossible to realise! A new way of flying...defenitely free! Otherwise, with a battery from 24 Ah, the Start-E is also an electric PPG, providing thirty minutes of flight using only the engine power. 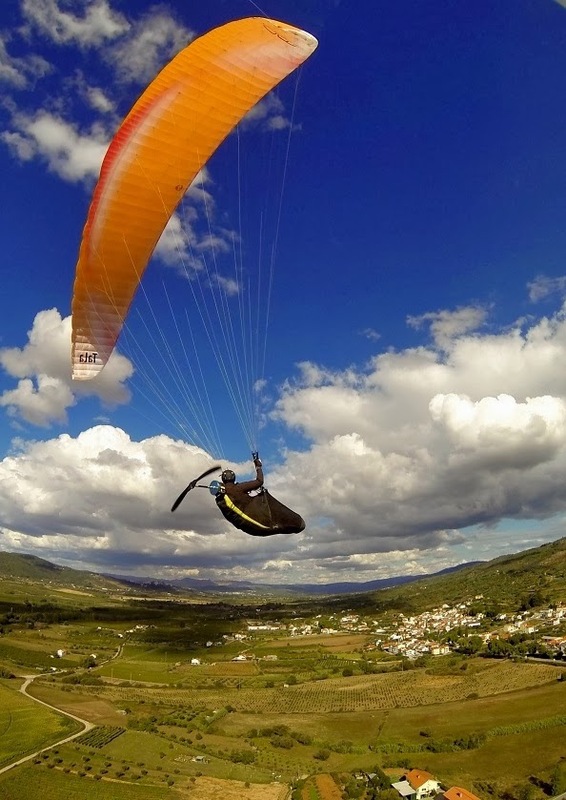 A really easy and eco-friendly paramotor. Technically, the Start-E will break all preconceptions that could have on the paramotor and its design. The recipe: innovate by developing a new chassis design which allows it to be more adaptable, perfectly balanced, simpler and more efficient. Made of carbon fiber and kevlar the Start-E chassis weighs only 1.2 kg. The rest of the weight are from the battery, the motor and propeller. The structure of the Start-E has been tested far beyond the limits required by the circular ULM-34864. The motorization of Start-E is inspired from that used successfully for years on the Swift-E.
With a battery of 10 Ah the Start-E weighs only 13 kg, with 24 Ah weighs 18.5 kg, making it probably the world's lightest paramotor, besides with full electron! The frame is attached and removed in minutes on a real free flight harness, previously upgraded, but the geometry steal unchanged. Once in the air you will forget the Start-E; it has no influence on your position or the feeling of the air and control of your weight; excluding the effect of a slight increase in wing loading, you will keep your free flight feelings and performances. Finally Start -E can be stored with the rest of your equipment (wing, harness , ...) in a single paragliding bag high enough . The battery is independent so you can transport it and recharge anywhere. In Germany it has been approved on an experimental basis , a special status for certain electric drives, the outgoing ULM framework were placed under the responsibility of the Free Flight Federation .In Switzerland the regulation is being developed in favour of electric motorization. Whatever the regulatory aspect, appropriate training and hand deliver will be propose . Also the harness and your glider remains dual-use. At least, the Start-E will help you to save time and longs travels with offering unique opportunities to accomplish outstanding flights. You can also send us an email with your contact, in order to be informed in first-hand about the official release of Start-E. Some details in the pictures have been modify to not disclose prematurely the concept of Start-E.